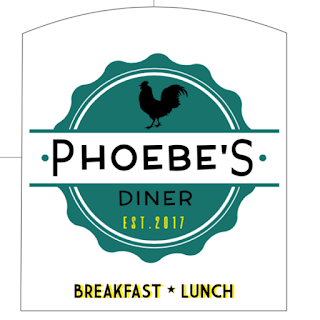 Phoebe's Diner, a comfort food spot, officially opened at South First and Oltorf on September 6th (533 W. Oltorf, on the southeast corner). Their sister restaurant, Winebelly is just a few doors down, along with Gilt, a nail salon. Quite the mini-empire being established! Phoebe's is open for breakfast and lunch, whereas Winebelly is open in the evenings so as not to compete with one another for parking spots or patrons. The Cheeky Monkey, a 6-minute egg wrapped in sausage and potatoes with sage sausage gravy. 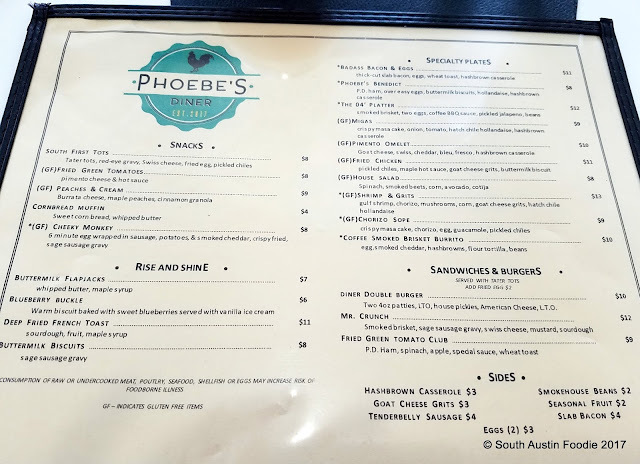 Friends wanted to go to brunch this past Sunday, and they chose Phoebe's. Normally I try to avoid new places for the first month or two so they can work their kinks out, but I was excited to check out this new spot in my Bouldin Creek neighborhood. We had the table right inside the door, which was nice and light-filled, though I never ventured more than six feet inside the door! 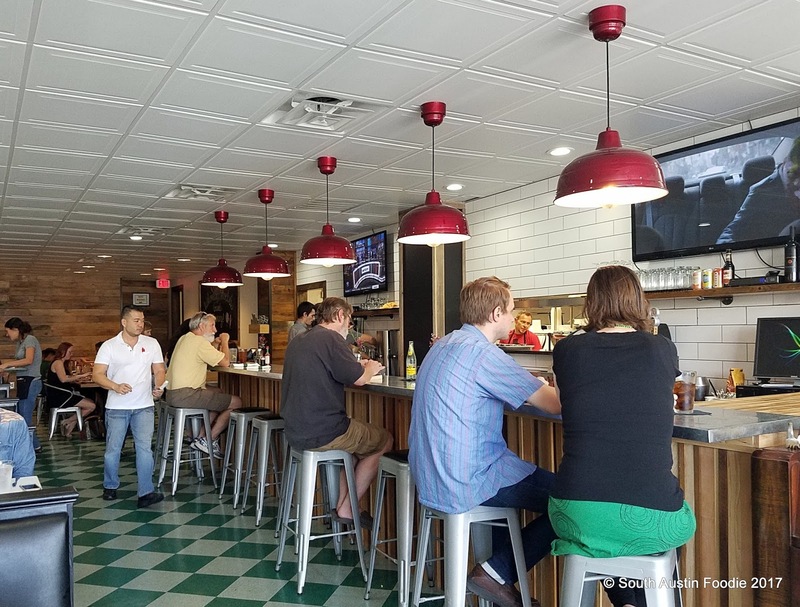 The interior is modern farmhouse with trendy but timeless shiplap walls and subway tile. They have a variety of mimosas (beet?) which tied us over as we studied the menu. Our friendly waitress immediately asked if we wanted separate checks, which made it easier for all of us. 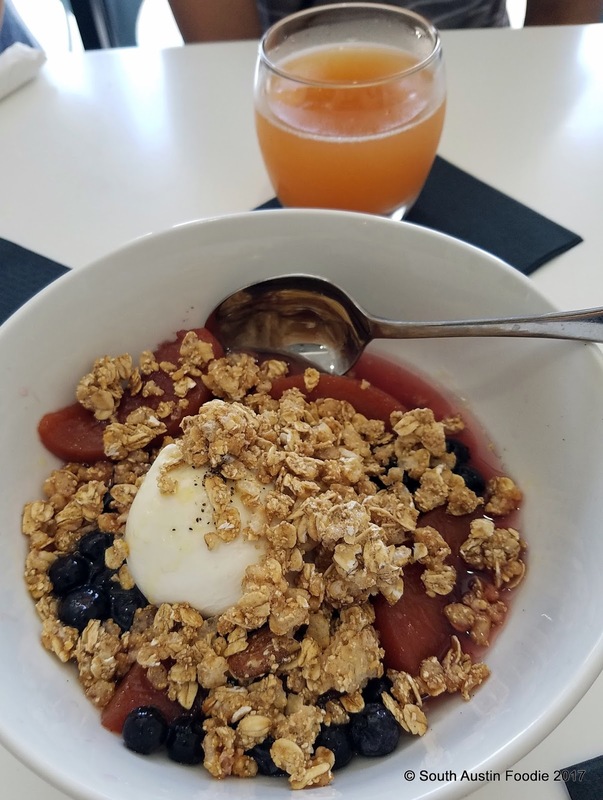 For the table, we started with the Peaches + Cream bowl, a twist on the traditional with burrata cheese and granola. I know that you can't get fresh peaches year-round, but a little disappointing that this is made with canned peaches. The flavors all worked together very nicely, and I could see getting this again, perhaps as a dessert. Peaches and Cream, with burrata being the creamy factor. But there were a few things that show the youth of Phoebe's. Of our group of five, two people ordered the Benedict, one shrimp and grits, one fried chicken + grits, and one Cheeky Monkey. The Benedicts and fried chicken came a full five minutes before the other dishes, leaving that awkward "Go ahead and eat" conversation. I noticed that the table across from us which had 4 or 5 patrons all appeared to get their food at the same time, so it can be done! 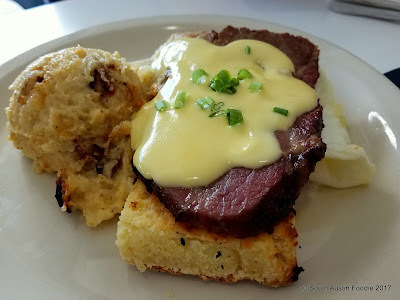 Phoebe's Benedict, ham, eggs, + hollandaise over a biscuit with hash brown casserole. 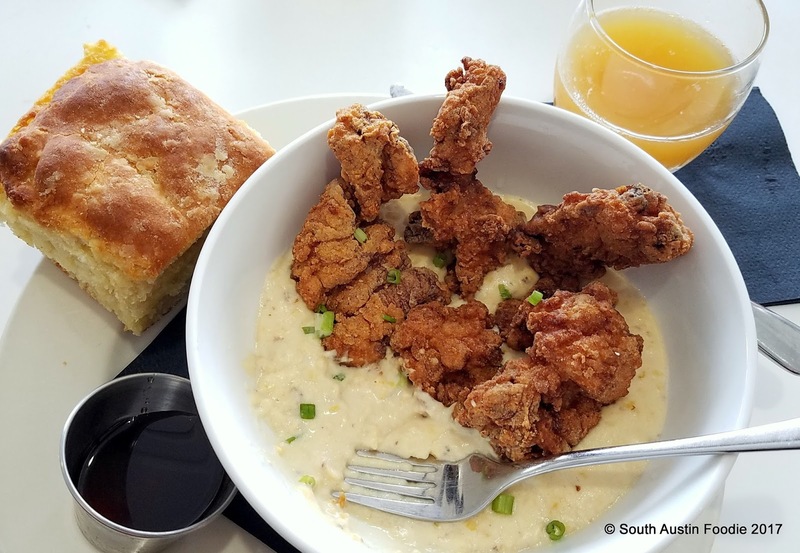 Fried chicken, goat cheese grits, and biscuit. Well, the very large biscuit arrived a moment later. It's huge, about 4 inches square and 2 inches thick, nicely browned on top, and fluffy. However, when you get into the middle of the thing, it was undercooked. Under a Benedict, you wouldn't really notice, but on it's own, you do. I could squeeze it together, and it made a little dough ball like you used to do with Wonder Bread when you were a kid. A few more minutes in the oven, please. 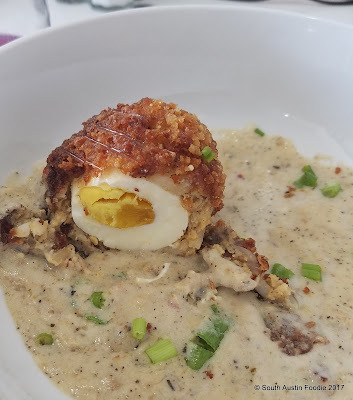 Fortunately the chicken was expertly fried and I think all of our eyes rolled back in our heads a bit when trying the goat cheese grits. Goaty and corny and rich. 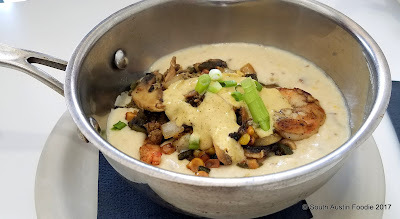 Same grits with the Shrimp + Grits dish, though I think it's even more grits! Gulf shrimp and goat cheese grits, with green chile hollandaise. Love the sauce pan as a serving dish. Overall though the food was quite good, and I think all plates were pretty much licked clean. They don't have an actual website up and running yet, so the link above (and here) is to their Facebook page. Here's a shot of the menu in case you are curious. I thought that everything was well-priced, and it's nice to see a variety of gluten-free items. My mother would probably bemoan the lack of fresh vegetables, but I don't think anyone ever called a salad "comfort food." Sorry, Mom. But yes, there is a house salad and a bowl of fruit available. So a few rough patches, but all in all a great new addition to South Austin! 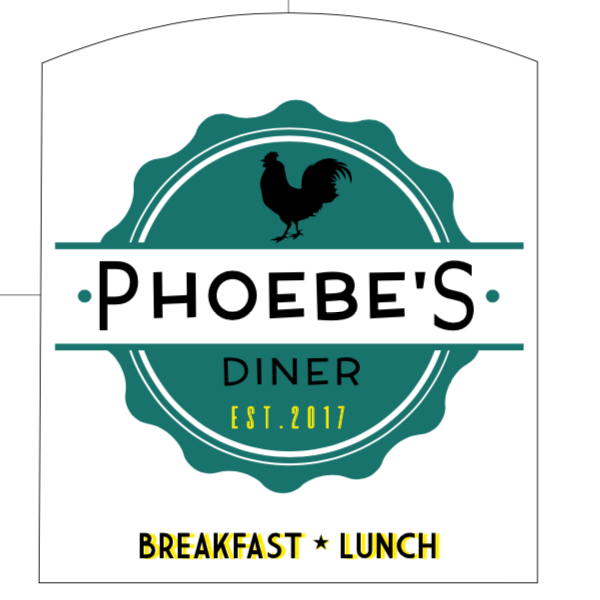 Welcome to the 'hood, Phoebe's Diner!